Remember that time 9 people peeled 30 pounds of crawfish? Yeah, that was hard work. And recently, in The Great Freezer Crash of 2012, we almost lost some of those babies! Well thank goodness, they survived after all. I’m not playing around with my freezer anymore. I’m making it a point to use up everything in it. Perhaps, some day, I will learn to trust the freezer again. But for now, I’m emptying it as fast as I can. The worker-bee friends who helped peel all the little mud bugs were over this weekend. Since we wouldn’t eat up their bounty without them, it was the perfect time to use them up. 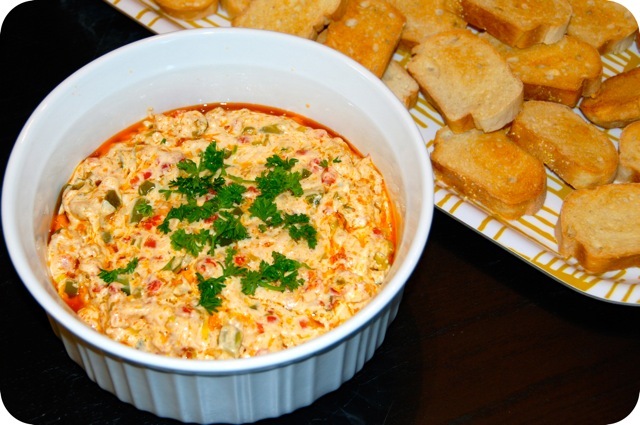 Nick and I had crawfish dip once on a trip to Mobile, Alabama, and it was fan-freaking-tastic. Though this isn’t an exact re-creation, it was definitely just as good. This recipe isn’t for the faint of heart. With a full stick of butter and a stick of cream cheese, you may want to chase it with a few asprin to loosen up those arteries. But hey, when in Mississippi! Melt butter in a large skillet over medium heat. 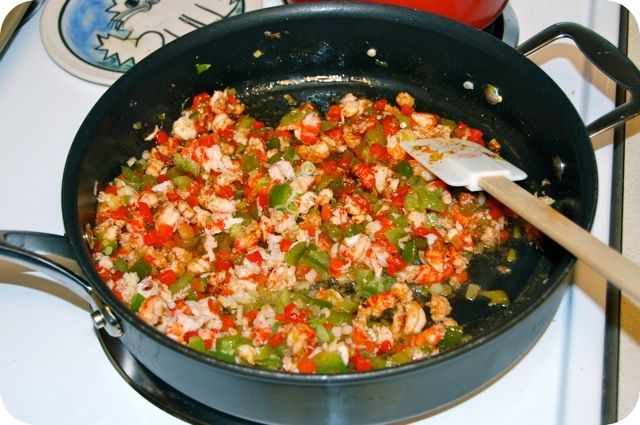 Add the green onions and bell pepper, and cook, stirring occasionally, about 8 minutes or until bell pepper is tender. 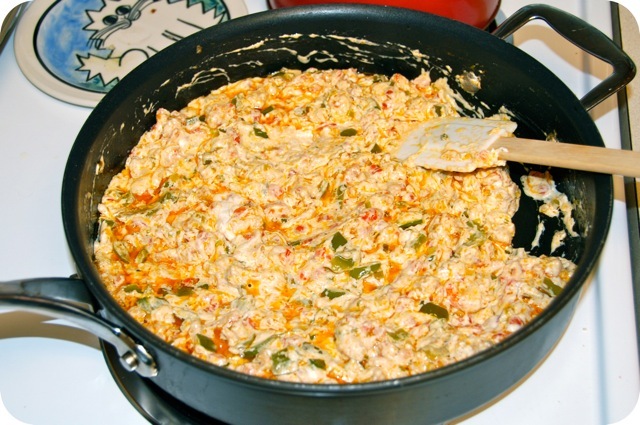 Stir in the crawfish, garlic, pimentos and Cajun seasoning and cook, stirring occasionally, 10 minutes. Reduce the heat to low and stir in the cream cheese until mixture is smooth and bubbly. Admittedly, I tried not to eat too much of this dip. I may or may not have had to have my wedding dress taken out a couple weeks ago, and… I’d like to not have to do that again. But man, was self control hard. 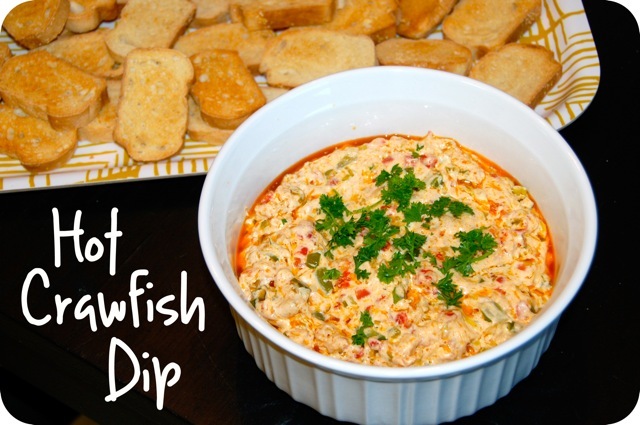 The dip was like a hot, cheesy version of etouffee, and trust me, that ain’t a bad thing. Luckily, I had several ravenous men to help me with the dip. Judging by reactions, I’d say it was a hit! Sounds like a great dip! I’ve never cooked with crawfish before but I’ve got to give it a whirl sometime! Oh my goodness! How awesome is this? Crawfish is one of those foods that I’ve had and no of, but it’s not at all common around here. That makes this dip even that much more appealing. It sounds great!